Why is Pakistan’s affluent class so ashamed of getting extra food packed at a restaurant? Said the husband, upset over the fact that his wife asked the restaurant staff to pack the left overs which included one kabab, three-fourths of a naan and a bit of chicken karhai. She smiled and even carried the large mineral water bottle that was almost untouched with resolve. It was a delightful dinner my family and I were invited to and this conversation between our host couple was all too familiar. There is the “what will people think” attitude associated with carrying home leftovers and in doing so we forget that edible, clean and fresh food will be thrown away simply because we over-ordered. We associate affluence with wastage; wastage that is criminal in a country where 61 million people are food insecure and malnutrition and stunting are common. The numbers clash and vary, but all surveys and reports point in the direction that millions of Pakistanis live below the poverty line, with a 2015 World Bank report citing that the number is as high as over 50 per cent of Pakistan’s population. Women giving birth suffer from anemia, get too little protein and give birth to weak and often premature children. On the other side of the social see-saw, privileged Pakistanis continue to pile their plates with food at weddings and buffets or order more than they can consume and end up wasting food, an offence that should be made a criminal offence. But this criminal offence is not Pakistan specific. According to data released by the Food and Agriculture Organisation (FAO) of the United Nations, a total of 793 million people world over are estimated to be suffering from chronic hunger, regularly not getting enough food to conduct an active life. Of these, 791 million live in developing regions. Meanwhile, in every other Hollywood movie, we see people getting up in the middle of the meal saying “I’m done” and emptying half of their plates into the trash bin. Why did they heap so much food in their plates in the first place? And what precedent are they setting? The perpetrators of food wastage do so both at an individual as well as at a colossal collective level. Supermarkets and franchise eateries throw away clean food items, even though most items stay okay for a while after the expiry date is over. A very promising initiative in this regard is Lahore’s Robin Hood Army (RHA). The campaign intelligently used social media to mobilise volunteers and motivate food catering companies and restaurants to bring un-used food to those who needed to be fed. Can Pakistan learn from the recent initiative taken by France at the state level? 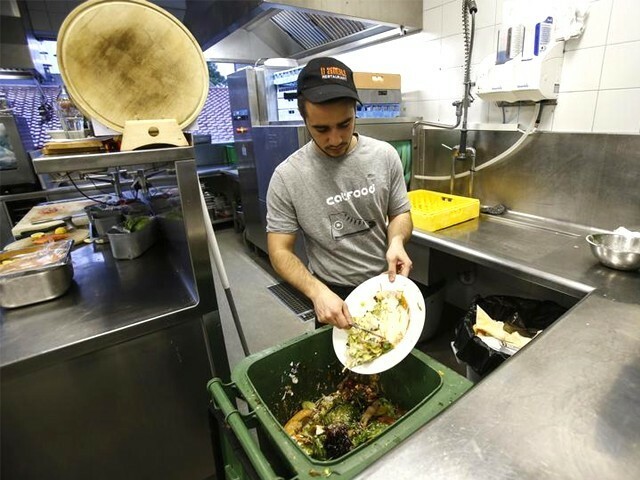 Recently, France became the first nation in the world that came up with a law that bans supermarkets from wasting food. French grocery stores will now have to donate unsold food to charities. As a result, millions more in need of food will be fed. The law is expected to spill over into all of the European Union eventually. Yet here we are, Pakistan’s thankless, skimming over pictures of malnourished children with big bellies in Tharparkar dying of hunger, doing the customary “tsk tsk”, and moving on wasting the crust of the pizza slice or throwing away half the meal because it does not taste well. The scourge of hunger is not just limited to districts like Tharparkar. Adjacent to Karachi’s affluent localities of Defence and Clifton, go visit the kitchens of your domestic help. Stories of malnourished underprivileged children abound. We follow international trends and become vegetarians and vegans for health reasons, but very few are ready to become freegans, or understand how freeganism can help feed more people use consumable food that needs to be reclaimed. We are environment friendly, or so we think, but are okay with writing off good fresh food just because the taste is not up to the mark. Maybe Pakistan needs a Tristram Stuart who comes and gives us a talk on food wastage repeatedly till we get brainwashed into respecting the food on our table. Our lopsided food choices and unnecessary nakhray (tantrums) are also responsible for this trend of food hemorrhaging. We, as a nation, are getting more and more inclined towards eating more meat. Thus, because of the imbalanced food choices of the privileged, the demand for these food groups increases. This results in a lot of good crops going into fattening livestock to provide more food from the dairy and meat groups. When the balance is lost, the entire food chain equilibrium is lost, with more humans going hungry. We can’t feed them all, but we can feed some. That packet of leftover food at the restaurant or café can be given to the kids at the signals. We can be more vigilant about giving away and sharing food items in our fridge and pantry before they are no longer edible. Small things will make a difference. But above all, we have to get rid of the ungrateful attitude towards food. We are the blessed ones. Let us be thankful till God is giving us enough food for the fill and share the blessing. Posted in Health, In The Loop and tagged FAO, food insecurity, food wastage, freegan, Robin Hood Army, Tristram Stuart. Bookmark the permalink.